The A' Advanced Design and Design Research Competition is a semi-academic design competition open to submissions of academic papers, poster presentations and research findings and visualization of research results and case studies by design professionals, academics, researchers, and prospective researches in design industry worldwide. The A' Design Award for Advanced Design & Design Research is not just an award, it is the indicator of quality and perfection in design research, the award is recognized worldwide and takes the attention of design oriented companies, professionals and interest groups. Winning the A' Award is a certificate of excellence for designers and researchers, an important milestone in your career. Having the A' Award attracts the eyes of design oriented companies and other academics worldwide, winners will be able to find better and higher profile offers, get a step ahead in their life. 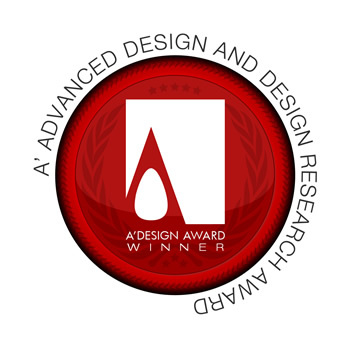 The winners of the A' Advanced Design & Design Research Award are provided extensive and exclusive marketing and communication services to promote the success of winning the A' Award. Proceedingswill be published and the winning submissions' poster presentations appear on the A' best designs book which is available worldwide, this book is furthermore distributed to the high-profile magazine editors, design oriented companies and relevant parties. Furthermore, winning papers will also be published at Advanced Design Research Annual, which includes not the posters, but the full papers of accepted entries. Select winning submissions are also exhibited at our museum in the form of a poster, and the best designs will be picked for the permanent exhibition. The winners appear on magazines, newspapers, webzines and many other publishing mediums. Since this is a concealed category, not all publications will be published. The winners of the A' Advanced Design and Design Research Award can opt-in for having their entries made visible and results published but this also requires approval from us. The Advanced Design & Design Research Award is for people who research, conceive in the mind, form, model, organize, prepare the structure and list the processes of a work to be executed in an interdisciplinary way. Advanced Design & Design Research Award is for people who are passionate practitioners and pioneers of design that create guidelines, make experiments and research about design. A1. Even though the design research category is concealed entry due to the type of entries, the entries could potentially be visible online. Especially the following could potentially be visible to public: “Project name, category name, primary function, designer name, and small thumbnail image”. Everyone interested in Advanced Design and Design Research can and should join. The award especially targets an audience with a solid academic background. Design researchers, design lecturers, design professors, designers, inspiring designers and students are welcome. The award is also open to people from different non-design fields in order to strengthen the multidisciplinary nature of the competition. If you use design to improve and advance, and if you could write a formal paper (or create a poster) about it, you are most welcome. The primary aim of the Advanced Design & Design Research Award is to develop the advanced design literature, taxonomy and fundamental definitions and to award leading researchers. The event further focuses on the application of Advanced Design in the form of Design Management, Design Strategy, and Research, to discover thinking patterns and principles in advanced design. The final aim is to discuss the design's role and vision in other fields and how design processes or tools are integrated in such fields, with the aim to focus on the multidisciplinary role of design. Please note that your papers, will be freely accessible to everyone without any charges (if accepted, after awarding and after another review) and you will not be able to modify them later. Thus it is of uttermost importance that you provide the required research and scientific due diligence in your publications. Please be reminded once again that NOT All accepted papers will be published; among submissions we will publish only entries with a superior poster presentation and graphic communication, therefore it is a very good idea to support papers with infographics, advertisement-style posters and visual communication techniques. You may submit your article for publication to the at any time, however to catch the next edition of the award results announcement date, you should submit as soon as possible. Because each time a proposal is submitted, it will be reviewed and will be either "fully accepted", "accepted with major changes", "accepted with minor changes" or rejected. Your submission must be "fully accepted" before it could be published, thus it is important that you start the procedure now, and follow the suggestions of the reviewers to fix or edit your papers. Each entry must accompany a poster presentation, using a 3600x3600 pixel image 72dpi jpeg. The research posters will be presented in various exhibitions around the world. The posters should be a visualization of what you present in the paper, Additional smaller images could very well data-visualizations of findings, further visuals and complementary photographs. Papers can be between 2 to 8 pages long. This event requires final paper submission both short and long papers are accepted however just abstract submissions are not accepted, yet for each submission abstracts are still required. Papers must present original material and will be reviewed rigorously by at least two reviewers in a double-blind process. Papers will be assessed for their contribution to the design field in all areas. You can write or submit a paper with visual presentation or a case study. For papers: You should write a paper that fits one of the sub-category tracks. In summary, you might submit a paper in three diverse themes. 1. The Core Stream; discusses Design and Advanced Design itself with the aim to develop the advanced design literature and fundamental definitions. 2. Applied Advanced Design which focuses on the application of Advanced Design in the form of Design Management, Design Strategy, and Research, the aim is to discover thinking patterns and to collect base principles in design. 3. Advanced Design Multidisciplinary Stream which discusses design's role and vision in other fields and how design processes or tools are created, developed or integrated in such fields, the aim is to focus on the multidisciplinary role of design. For case studies: Make a visual presentation and submit a PDF explaining the case study. Submissions are made over the A' Design Award platform, please scroll down the bottom of the page to see requirements and the template. To make a submission, simply fill your paper using the template and guidelines and submit it as a PDF to the system (to start click register now botton on the bottom of this section, and login with your credentials. Upload papers as if you are uploading designs, and nominate papers (send papers for review) using the nominate design section). Please download the publication template here. PRIMARY FUNCTION: Enter the Subtitle of Your Proposal here, if you do not have a subtitle, type in "Design Research". UNIQUE PROPERTIES / PROJECT EXPLANATION: For this section, please indicate the track/theme of your research. COMPETITION & CATEGORY : Choose "A' Advanced Design and Design Research Award". INSPIRATION: Type in why you decided to make this study. PRODUCTION OR REALIZATION TECHNOLOGY (AND MATERIALS)*: For this section type in the type of scholarly work: Research, Practice, or Theory orientation. SPECIFICATIONS / DIMENSIONS / PACKAGE / TECHNICAL PROPERTIES*: Type in number of pages. TEAM MEMBERS*: Type in co-authors for this publication. TAGS / KEYWORDS*: Type in some keywords to mark your paper. OPERATION / FLOW / INTERACTION**: Type in the citations of your paper. PROJECT DURATION AND LOCATION**: Type in your affiliation and University. THE CREATIVE / RESEARCH CHALLENGE**: Type in what was the most difficult issue for this research. Remaining fields are optional, and no need to be filled. Click Save and Continue, and a new page will appear. In this page, you can upload the poster (main image 3600x3600 pixels). You can also upload four additional images and tables. If you do not have the poster or images ready, it is okay (you can upload them later). Proceed to next step by clicking on Save and Continue. On this page, you will be seeing a preview of your submission. To upload your paper presentation, please click "Update Documentation" button. Choose your PDF File to upload your paper (you can download the template below, and save it as PDF). Upon upload, you will be redirected back to your submission preview. From this page you can edit or modify your submission as many times as required. Once you think your submission looks good, and information is correct, scroll down the bottom of the page to Nomination Section. Follow the steps to complete the payment. Payments can be made via credit-card, wiretransfer or other methods. Once the payment is made, your paper will be send to two independent reviewers who would comment on your paper. You might be required to make changes to your paper before it could be published. NOT All accepted papers will be published. Selection is based on Seven (7) Criteria: 1. Coherence : Your research should cover purely design or implementation of design in other fields. 2. Methodology: Your submission should clearly explain the methodology used (either new or pre-existing) and must also support your decision of the used methodology based on evidence that it is coherent and related with the aims of your research. 3. Data Consistency: You should indicate how the data was collected and if this data are well selected and related to your topic and whether if your data are consistent. 4. Original Contribution and Critical Qualities: Your research topic should either cover a contemporary and fashionable topic, or should re-cover an old topic in a new way. It must be interesting and should provide new, uncovered knowledge in the field; it should fill a gap of knowledge. Finally, it should also critically demonstrate self-awareness of your own perspectives and interests. 5. Bibliographic Richness and Use of Existing Knowledge: Literature Review: Your submission should demonstrate an adequate understanding of the current literature. Your references should be relevant and good. 6. Clarity: Your submission should be clearly demonstrating a point; with conclusions etc. 7. Design of the Poster. You should be able to make a visual demonstration of your research in the form of a poster, this is especially relevant as one of the aims of this event is to make design research accessible; we will forward your posters to a design-oriented media for publication possibilities in common media as well. Previous winners for the Advanced Design category are not publicly displayed, however further information and press kits could be available upon demand to press members and interested parties, please contact us for press kits in this category. Furthermore validation service is possible to confirm award status and qualification; please contact us to verify if a service or product is indeed a winner of the Advanced Design Award. Documentation Max. 40 x A4 Pages PDF Click to download the Submission Template in MS Word Format that should be used to prepare the Documentation PDF for Advanced Design and Design Research Category.